If you bought a bicycle in the last ten years, chances are that you have a hub dynamo for the front light and that your tail light runs on batteries. Besides being silly (why would you want to pay for batteries), it is also impractical (you need to remember to switch it on and replace these batteries). My tail-light has an extra feature: it automatically switches off when you least expect it (e.g. a little bump on the road)! If you're like me, you will want to have a tail light that is always on (hub dynamos don't require much power from your legs) and that does not require batteries. This post will investigate how this can be done. So, I double checked mine (it's a Shimano DH-2N35) just to make sure... and it is a 2.4w 6v hub dynamo and has no over-voltage protection. No big surprise here. Since I want to make the new light fit inside the existing tail-light housing, the new circuit will be a compromise between its efficiency and space. 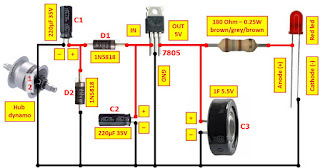 Instead of re-inventing the wheel, I had a quick look at what the Internet has to offer and found this site suggesting tons of circuits for bicycle lights as well as this post. After looking a little longer, I found an elegant solution from Atoomnet where the light would remain on even during a (not so) short stop at a crossing/traffic light. The following sections will explain how these circuits work. 6v AC is provided by the dynamo on the left side of the circuit. There is no guarantee the voltage will not reach higher values. Current flows through D2 and charges C1. C2 has +6v on its negative side and its charge gives it 6v extra on its positive side. We therefore have 12v. C2 cannot discharge through D1 (blocking <20v) and continues discharging its 12v through IC1. and we start over: current flows through D2 and charges C1. The 7805 voltage regulator gets something between 0v and 12v (theoratically) from the charge pump and stabilises the the output voltage (on the right) to 5V. This 5V will charge the supercapacitor (C3). The output of the 7805 charges C3 (which is our super capacitor) up to 5v (which is the max voltage IC1 provides), never reaching the 5.5v maximum for our capacitor. Since we are using a voltage regulator, if we're below 5v on the charge pump (its left), the charge accumulated in the supercapacitor will not flow back. According to its specs, it requires as input voltage between 7 and 25v and can provide a current up to 500mA (which is limited by the capacity of C1 and C2 anyway). When the charge of C3 reaches approximately 2v, our red diode starts letting current flow though it and our taillight shines ! Since C3 is a supercap, you can stop for a (not so) short while at a traffic light and your tail light will remain on (for about 30min). The point is to make sure a kid could do it without any knowledge in electronics. Just wanted to let you know that this whole idea is just great! I used your methodology for my Sigma headlight and it worked out quite well. I used LM78L05 to save space (it has lower current output though). Next, I doubled the capacity of the pump because I have a in–hub dynamo which offers a lower AC frequency. Then I used 2 white LEDs to make most of the front reflector. I wish the pump charged the supercap faster. The standlight in the headlight takes noticeably longer to activate than the stock one in the back but it isn't so bad. Maybe a .5F supercap would solve that but I couldn't find one in my local shop so in the end I went with 1F. Hi, thanks for the extra info, I'm sure it will be useful :-) I like the changes for the hub dynamo, I guess more and more people will be having one of those.